pgRouting was first called pgDijkstra, because it implemented only shortest path search with Dijkstra algorithm. Later other functions were added and the library was renamed to pgRouting. This chapter will cover selected pgRouting algorithms and some of the attributes required. Exercise 1 - Single Pedestrian Routing. Exercise 2 - Many Pedestrians going to the same destination. Exercise 3 - Many Pedestrians departing from the same location. Exercise 4 - Many Pedestrians going to different destinations. Exercise 5 - Many Pedestrians going to different destinations, interested only on the aggregate cost. Exercise 6 Single Pedestrian Routing with A*. Dijkstra algorithm was the first algorithm implemented in pgRouting. It doesn’t require other attributes than id, source and target ID and cost. You can specify when to consider the graph as directed or undirected. Description of the parameters can be found in pgr_dijkstra. Many pgRouting functions have sql::text as one of their arguments. While this may look confusing at first, it makes the functions very flexible as the user can pass any SELECT statement as function argument as long as the returned result contains the required number of attributes and the correct attribute names. Most of pgRouting implemeted algorithms do not require the network geometry. Most of pgRouting functions do not return a geometry, but only an ordered list of nodes. The pedestrian wants to go from vertex 13224 to vertex 6549. The pedestrian’s cost is in terms of length. In this case length, which was calculated by osm2pgrouting, is in unit degrees. From a pedestrian perspective the graph is undirected, that is, the pedestrian can move in both directions on all segments. With more complex SQL statements, using JOINs for example, the result may be in a wrong order. In that case ORDER BY seq will ensure that the path is in the right order again. The returned cost attribute represents the cost specified in the edges_sql::text argument. In this example cost is length in unit “degrees”. Cost may be time, distance or any combination of both or any other attributes or a custom formula. 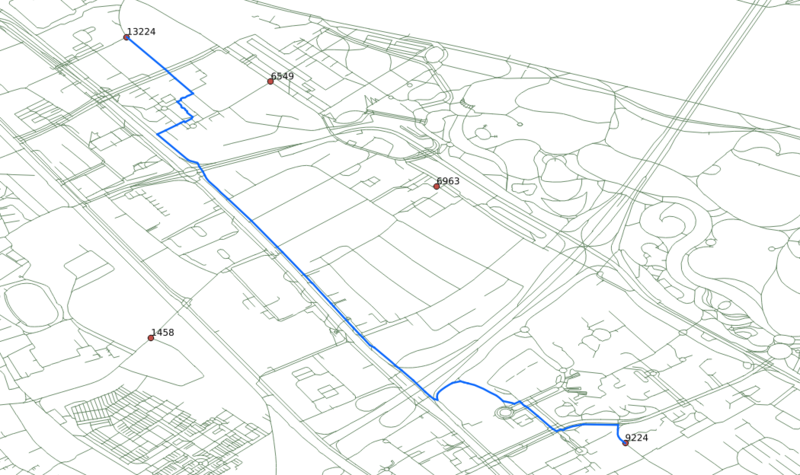 node and edge results may vary depending on the assignment of the identifiers to the vertices given by osm2pgrouting. The pedestrians are located at vertices 6549, 1458 and 9224. All pedestrians want to go to vertex 13224. The cost to be in meters using attribute length_m. All pedestrians are starting from vertex 13224. The pedestrians want to go to locations 6549, 1458 and 9224. The pedestrians want to go to destinations 13224 or 6963. When the main goal is to calculate the total cost, for example to calculate multiple routes for a cost matrix, then pgr_dijkstraCost returns a more compact result. A-Star algorithm is another well-known routing algorithm. It adds geographical information to source and target of each network link. This enables the routing query to prefer links which are closer to the target of the shortest path search. Returns a set of pgr_costResult (seq, id1, id2, cost) rows, that make up a path. Description of the parameters can be found in pgr_astar. The pedestrian’s cost is length, in this case length is in degrees. The result of Dijkstra and A-Star might not be the same, because of the heuristic component. A-Star is theoretically faster than Dijkstra algorithm as the network size is getting larger. A new Version of A-Star is under development.